Following work within the community on collecting and distributing food to the needy Dave Bagley of Urban Outreach (Bolton) was invited to the Westhoughton Community Network meeting in February 2013 to talk about Foodbanks, giving background about why they are needed, take-up within Bolton and Westhoughton and how as a community network we might come together to co-ordinate this as a mission within the town, using our network of church, community groups and even schools to establish and build a Foodbanks resource. At the meeting it was decided to take this idea forward by forming a sub-committee to discuss, plan and implement the necessary actions to progress this community initiative. 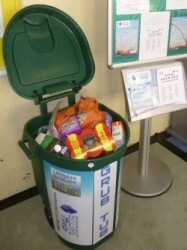 Under the banner of the Westhoughton Community Network member groups would work with Urban Outreach initially collecting gifted food collected in Urban Outreach 'Grub Tubs' which will be located around Westhoughton. Donated food would then be collected by Urban Outreach for distribution from their Salop Street warehouse to individuals and families in Westhoughton as per the voucher system implemented by the various agencies charged with identifying need and making sure those that need this help and support can be served by Urban Outreach distribution network. Tins, jars, non-perishable items; also toiletries welcome. Collections for distribution though Urban Outreach are made on a weekly basis (Tuesdays).